When humanity harnesses the force of and truly empowers women, it has an exponentially positive effect on any society. Women have been at the forefront of many important fields of research, study and have had organizational integrity through the ages. Maritime law should not remain a sector relatively devoid of talented and hard-working women. A few women captains, marine engineers, sailors, maritime lawyers, owners and so forth, who have already joined this industry, have immensely enriched this global sector and make it stronger. 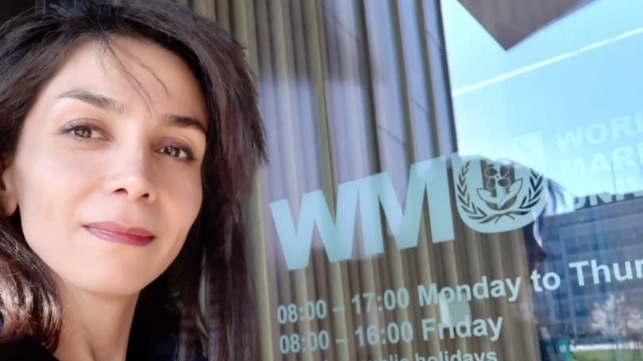 I stand before you today as the first Iranian woman lawyer, graduated from India and researcher of Human Rights at Sea (HRAS) in London, in the field of human rights at sea and maritime security and safety. I stand before you as a voice; a voice for hope for the further growth and proliferation of Human Rights at Sea. I am honored to stand here as a member of HRAS, a non-government platform that in the last month has started developing the first draft for a Declaration of Human Rights at Sea alongside the United Nations and civil society and academic experts. That detailed research has now been submitted to the World Maritime University. I have been looking forward to presenting my research on behalf of seafarers from every corner of the world, their families and their shore-side colleagues. It is for them that we pick up the daunting task of making the future safer for everyone. -The Enrica Lexi Case in 2012: small arms firing at fishermen within Indian territorial waters and the high seas. This case addresses the stark lack of law and the lack of law enforcement on the high seas. -The Case of abandonment of the MV Iba, with seafarers from India, Pakistan and Sri Lanka who were illegally detained on board ship for almost six months without access to such basic necessities as water, food and medical treatment. -The Case of abandonment in Angola, Africa, where seafarers were facing illegal detention and investigation. The victims of this lawlessness attempted suicide due to the mental torture they were forced to suffer. -Finally, the most recent and ongoing case of abandonment, the MV Halani off Namibia, involves eight Indian seafarers who have been on board the ship for almost two years but still cannot leave because of port State restrictions. I would also say that the first abandonment is always accompanied by “second abandonment,” and that is the indirect and sometimes invisible abandonment of seafarer’s families, both old and young, their loss of income, homes and possessions. From the international legal perspective, one key issue that must be addressed is that the 1982 United Nations Convention on the Law of the Sea, which is one of the most comprehensive international conventions, is woefully absent of human rights at sea and makes no explicit reference to human rights at sea. In reference to abandonment, the MLC 2006 as a financial system provided by the IMO and ILO, has been effective in curtailing abandonment cases, but the key issue with the MLC is still the lack of monitoring and enforcement, and what we say is the lack of effective remedy. In most other documents and regulations that establish jurisdiction, we face a lack of monitoring and reporting of human rights abuses, and that means the aggressors go unpunished and the victims suffer the consequences, exacerbating this real lack of awareness. The second key legal issue is that States are not able to have jurisdictions beyond 12 nautical miles from the coast. The lack of law and insufficient law enforcement on the high seas causes seafarers to suffer the consequences of improper systems of governing and illegal procedures aboard vessels. The position of many: “out of sight is out of mind” must be strongly challenged. If we are to succeed on the high seas in the modern era, we must support abandoned, injured or otherwise compromised seafarers, fishermen, as well as migrants and refugees, and do so legally and ethically. To assist them, we need to have, at the very least, a wide-ranging Declaration or Charter of Human Rights for Seas. Additionally, we need new maritime administration systems and better legal enforcement which can be applied on the high seas, as well as within territorial waters and contiguous zones, with enough flag State and naval vessels to uphold the rule of law at sea. We need to bring two legal areas of law into the modern era, as they have never before existed, as a combined and explicit body of law. And if you ask how does this system works, I would say I am ready to provide this proposal to the World Maritime University. The modern day Law of the Sea and International Human Rights Law, that when combined, come under the title of “Human Rights at Sea” must now coexist and be bound together to be of value to our individual human rights, for better ocean governance and the world at large in terms of security, safety and freedom of navigation. Seafarers should always be aware of their human rights, whether on land or on the earth’s vast oceans and seas. The rights of personal liberty and freedom must not be ignored but protected and with vigilance. Please never forget that your human rights and fundamental freedoms are inalienable and cannot be taken away by shipowners or any states or any organisations. It is therefore our opportunity and our obligation to our future and ourselves to establish, enforce and protect the right to be free from torture and abuse at the hands of any hostile force. If I have learned anything during my time studying it is about the power of hope, it’s the power of one person and one idea which makes the difference in others’ lives. Today, I welcome a day when ladies who wish to stand here before you may face difficult tasks with hope, hope for a future with eyes to see the problems that need to be resolved to sustain our species and the world at large. This path is not an easy path. It takes courage, you may need to take some smart risks, step up when times are the toughest, go forward knowing that the world is not fair and that you will fail often. Face down the bullies, lift up the downtrodden and never ever give up, so the next generation and the generations that follow will live in a world far better than the one we have today, and what started here will indeed have changed the world for the better and what we do here is the better basic principle that human rights apply at sea, as they do on land.